the 1972 Willamette Pass ski patrol pose for a photo. We still don’t know which came first, the chicken or the egg. But here’s the answer to a similar conundrum: the Willamette Pass Ski Patrol actually does predate the Willamette Pass Ski Area. The Willamette Ski Patrol — parent of both Willamette Pass Ski Patrol and Santiam Pass Ski Patrol — was born in December 1938, just months after the National Ski Patrol was formed by Charles Minot Dole. It’s true that the U.S. Forest Service authorized the Upper Willamette Winter Sports Association to begin clearing timber and brush from McFarland Butte — now known as Eagle Peak — in 1941, which is a year before Willamette Pass Ski Patrol distinguished itself from the original organization. But it would be 1945 — another three years after the home mountain got its exclusive ski patrol — before the Forest Service contracted with a concessionaire for the ski area’s first permanent rope tow. “The Obsidians (hiking and outdoor club) are the ones that actually started the ski patrol,” says former Willamette Pass Ski Patrol member Bill Temple, whose uncle, Roy Temple, was a founding member of the patrol and operator of that first ski tow. The National Ski Patrol has no archives to document the history of individual patrols, but the early emergence of WPSP tends to support a bit of local trivia — that the “035” prefix in the NSP numbers of Willamette patrollers means they are part of the 35th patrol to join the national organization. 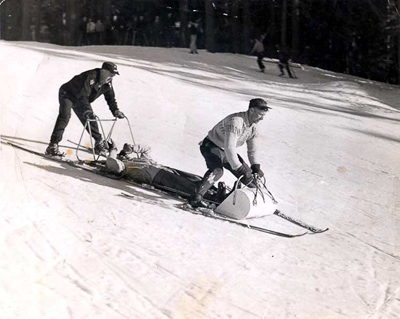 Jack Meissner is in the front handles and George Korn in the rear handles of this old-time Toboggan photo from 1950. Did someone mention trivia? How about the fact that the By George run at Willamette Pass is named after George Korn, who owned the area from 1949 to 1962? Or that Swoosh! is a clever reference to the early Nike investments of the area’s current owners, the Wiper family, and June’s Run is named in honor of Tim Wiper’s mother; Good Time Charlie for his dad, Charles Wiper; and Sally’s Way for Tom Wiper Sr.’s spouse at the time. Did you know that RTS really does not stand for Really Tough … anything? It was named for Richard T. Satagaj, an owner of the area in the early 1980s. Amber’s Way and Lois Lane, both located at the bottom of RTS? Those are named after Satagaj’s daughter and wife, respectively. “There’s a history to all the runs,” says Dave Brown, a member of the patrol since 1977 and its director on three separate occasions, for a total of 11 years. And the histories of the mountain and the patrol are hopelessly intertwined. The early Willamette Ski Patrol was organized by the Obsidians and a group called the Eugene Ski Laufers, and patrolled informal ski sites — some with portable rope tows and some without — in both the Willamette Pass and Santiam Pass areas. Members of the patrol were required to take a first aid class from the American Red Cross, which donated — get this — a first aid kit! A December 1938 story in The Eugene Register-Guard mentions a “ski train” that took as many as 600 Eugene skiers per trip to Crescent Lake, where residents had built a 1,000-foot-long, 100-foot-wide ski run. But no mention of a ski lift or tow. 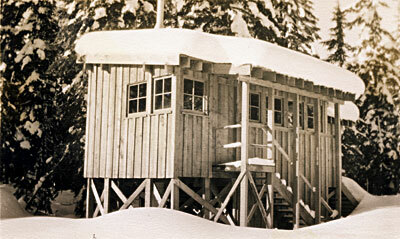 The original patrol building was elevated off the ground. The Obsidians bought their first portable rope tow in 1940, for $342.50, according to the group’s newsletter. Its 1,200 feet of rope cost another $14. The Obsidian — monthly newsletter of the club by the same name — reported that the overall Willamette Ski Patrol (Willamette and Santiam) had a nucleus of 11 members in 1945, with its fluid membership expected to hit about 30 during the ski season. And the newsletter reported a year later that the patrol had cashed in during its annual fund drive, by raising a total of $417. Sign from the original Gene McMurphey shelter. 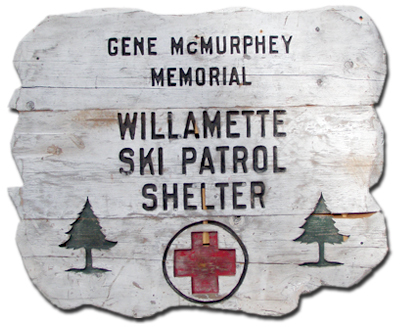 Gene McMurphey, who was Souza’s partner in the Mount Hood toboggan competition, was killed in an industrial accident a year and a half later, and the Gene McMurphey Memorial First Aid Shelter — the first patrol building at Willamette Pass — was completed in 1951. Meanwhile, George Korn had purchased Willamette Pass Ski Area in 1949, and went big time in 1959 by purchasing the 3,000-foot poma lift that would be a Willamette Pass fixture well into the 1970s. The lift cost $50,000 and was installed in 12 days. “I was from Lebanon and mainly skied at Hoodoo, but I ran across (Orville) Caswell (an early Willamette Pass patroller), and Ory talked me into joining the ski patrol,” Temple says. Despite being a small patrol from a small ski area, WPSP still managed to make a splash in the much bigger pond of the National Ski Patrol. Four Willamette Pass patrollers were asked to serve as NSP patrollers for the 1960 Olympics at Squaw Valley, and three accepted. Caswell declined his invitation, but Allan lindley, John Quinner II, and John Nasholm represented Willamette Pass on the Olympic stage. 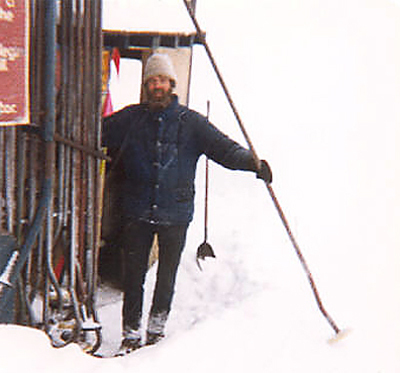 Arnis — who also ran a ski school at Willamette, in conjunction with The Register-Guard — actually took over operations at Willamette Pass in 1962, when a group of 10 Cottage Grove teachers purchased the ski area from George Korn for $55,000. 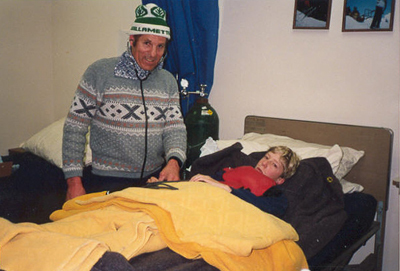 That was the start of a tumultuous 20 years for the ski area, with at least eight ownership changes, two or three seasons when the area remained closed and one period when the ski patrol was replaced by management employees. Bill works the original poma lift. The Cottage Grove teachers owned Willamette Pass until 1968, when their initial $55,000 investment had grown to a debt of $100,000. The Eugene-Lane Teacher’s Credit Union — which later became SELCO — took over when the teachers were unable to make payments, and operated the area for a year before it was purchased by Keith Hedeen. But it was while the teachers owned the area — and Arnis operated it — that the ski patrol had its only hiatus in a 70-plus-year relationship with the ski area. It happened during February of 1967, when WPSP leaders pulled their members off the hill in a dispute that began when the area manager converted their patrol building to other uses. “The ski patrol contends its national standards were jeopardized when the building it used for its operations was turned into a multipurpose building by Arnis,” according to a Register-Guard story about the spat. The disagreement was eventually resolved, and patrol members returned to both the mountain and their patrol room. But a similar difference of opinion over boundaries between the patrol and area management also led to a break in service years later for Duncan, who was patrol director at the time. 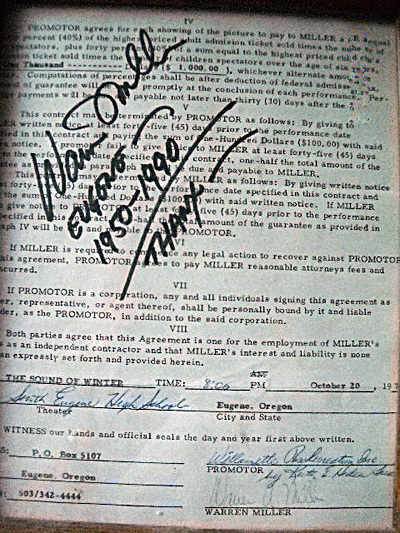 Ski movie pioneer Warren Miller came to South Eugene High School in 1970 for a film showing that benefited Willamette Pass Ski Patrol. Duncan says the same owner built a shed in front of the old patrol room to house a hot tub for his private use. “That building is now part of the existing patrol room,” Duncan says. Turmoil at Willamette Pass hit its high point during the late 1960s and early 1970s, when the ownership went from SELCO to Hedeen, then to Hoodoo Ski Bowl, to Mike Neary, back to Hoodoo and finally — in 1980 — to Richard and Lois Satagaj (of RTS fame). The ski area had been closed due to lack of snow for at least one season during the Cottage Grove teachers’ ownership, and Hoodoo kept the area shuttered again during the 1976-77 season as another buyer was sought. 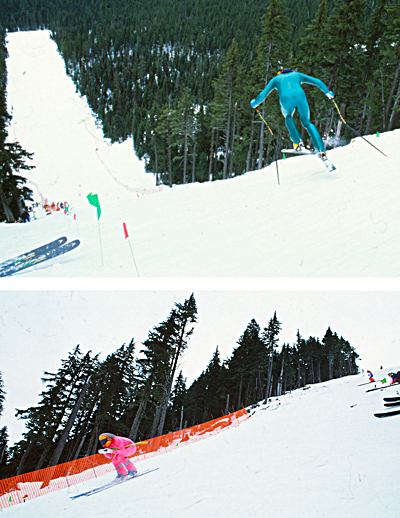 Neary bought the ski area but struggled from the beginning, and Willamette Pass remained closed again for the 1979-80 season as Hoodoo took over in a foreclosure action. That was a turning point for the ski patrol. Some of its members accepted an offer to transfer to the Hoodoo patrol, and the few who remained waited for ownership conditions — and snow conditions — to improve. Duncan recalls another unpleasantness from the poma lift days. The springs on many of the pomas had worn out, and when a lift rider put one between his legs and took off there was often a surprise in store. Hal Duncan works in the Patrol Aid Room. Current patrollers Larry Cox and Ron Wilson were among the contingent that put Willamette’s poma lift behind them and headed for Hoodoo and its up-town chairlift in 1979. During their absence, the Satagaj family purchased the ski area. The new owners got Willamette Pass up and running, and headed in the right direction. But like previous operators, they ran the place on a shoestring. 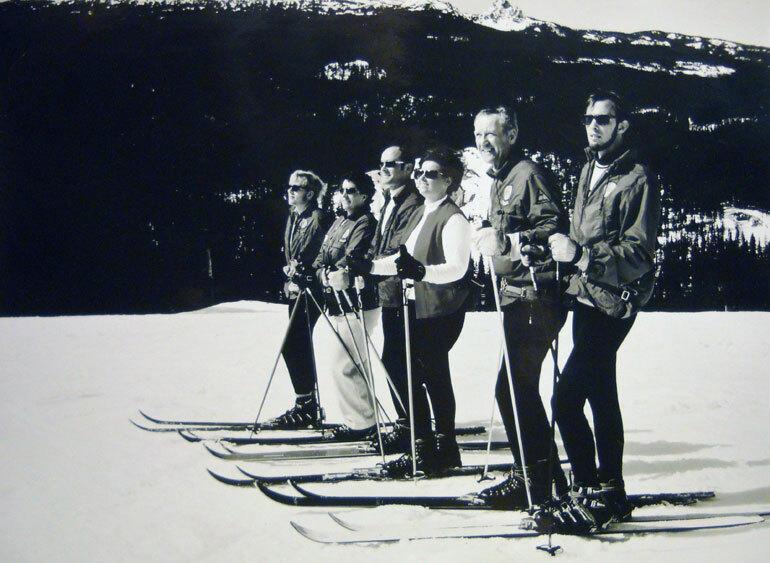 During the 1981-82 season, the Satagaj family took on Charles Wiper, Jr., and his family as partners, and the Willamette Pass Ski Corporation was formed. The following summer — in the first of several investments by the Wipers — a double chairlift was installed to carry skiers for the first time to the top of Eagle Peak. That meant an influx of skiers, which would require reinforcements for a suddenly short-handed ski patrol. Those who had gone to Hoodoo were invited back, and several accepted. The modern era of both the ski area and its patrol had begun, but that doesn’t prevent a little nostalgia from those who lived through the earlier days. “Knee (injuries) and tib-fibs were very common back then, and there were back injuries, too,” Wilson says. “It wasn’t uncommon for a beginner to come up with old leather straps on old wooden skis, so when they fell nothing released. And they all took a hand in guiding the patrol — more or less. The patrol's duty-day rotations were similar to those used now, but to Cox that was immaterial. “It didn’t matter to me, because I was there every day, anyway,” he says. 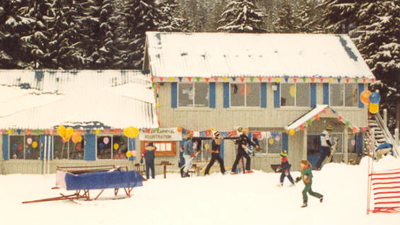 The original lodge, decorated for carnival, now used as the patrol aid room, ski school basecamp and Willamette Pass dispatch. By 1983, the now-flush ownership group was ready for more moves. The Satagaj family left Oregon to develop a ski area in Pennsylvania, and the Wipers took control of Willamette Pass. They built the current-day lodge and added the Twilight Chair, opening Willamette’s first substantial terrain for intermediate skiers. The Midway and Summit triple chairs replaced the original double chair in 1987, and the Sleepy Hollow chair was added the same year. Peak 2 expanded skiing to the mountain’s north side five years later, and the high-speed Eagle Peak Accelerator replaced the Midway and Summit chairs 10 years after that. The old, A-frame ski patrol room is long gone — moved to Crescent Junction, in fact, where it’s now an apartment. The current patrol room is on the ground floor of what used to be the ski area’s lodge. With the mountain’s growth have come a variety of features, promotions and events, from bonfires to barbecues, from Ski Wee to Freeheel Frenzy and from high school races to, well…. The Willamette Pass growth boom was punctuated in 1993 by an event called the Subaru U.S. Speed Skiing Championships. It was held on RTS — considered one of the nation’s steepest ski runs (52 degrees at its steepest) — and produced a top speed of 116.56 mph. Brown, the former patrol director, says it also produced injuries including a ruptured spleen, and resulted in the first helicopter landing on the run-out of RTS. Brown and others who patrolled through the old times are duly impressed by what has occurred both on the mountain and in the patrol over the past 30 years — particularly by the unprecedented growth and stability. They also have an appreciation for those humble beginnings. Speed Skiers skiing down the RTS speed course. Brown remembers the ski patrol leading the way for the mountain. The patrol has continued to be stable, and the ski area has followed suit since brothers Charles Wiper, Jr., and Tom Wiper, Sr., bought a 60 percent share of the resort in 1981 and promptly spent another $750,000 on the ski area’s first chairlift and other improvements. That new name was Eagle Peak, and the Wipers have remained committed to the ski area as they assumed control of the entire company, expanded and made various improvements, and passed reins to the company from Charles Wiper to his son, Tim. It all began as the Hult Center for the Performing Arts was opening in Eugene, and Brown remembers the rebirth of Willamette Pass as the Wiper family’s legacy of choice.